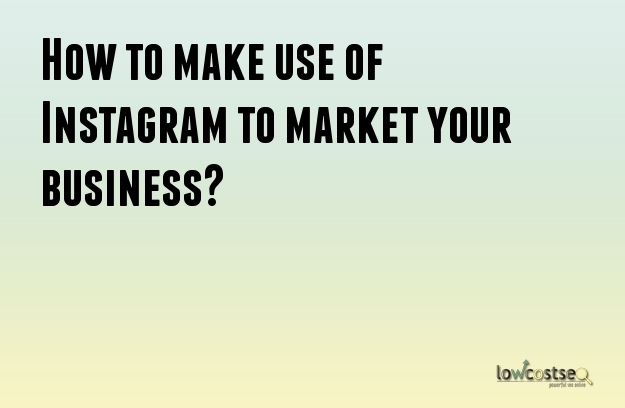 How to make use of Instagram to market your business? Instagram has become one of the major social networks in the world. Considering its widespread popularity, there are many companies and businesses that have begun to devise ways to exploit it as a marketing tool. Just like Facebook and Google plus, Instagram can be a viable marketing tool when used correctly. One major benefit that you get while using Instagram is in followership. Organically, you can reach all of your followers without any exception through your posts. This is not possible with Facebook. You can use Instagram to build your brand and engage with your customers. However, take a look at its facts before marketing through it. The popularity of Instagram has reached phenomenal proportions. It is a great platform to build a brand and interact with clients. Instagram has more than 300 million users active every month. More than 30 billion photos are shared on a daily basis. 70 million photos are posted everyday on an average. The minimum number of likes given each daily is 2.5 billion. Facebook is certainly a great place to interact with your fans and followers. However, the organic reach of your page in Facebook is only 3%. In other words, out of every 100 fans, only 3 of them will see your post. In Instagram, you get 100%. This brings with it the increased possibilities of engaging with customers, brand awareness and lead generation. Now that you know about Instagram, you can start trying to market your business via the platform. Simply creating a profile will not be enough. You will have to optimize it as well. Use a username that is easily remembered. It is preferable to use the Twitter handle for the Instagram profile. You can use the company logo as the profile picture. The biography should be short but strong enough to impress. Now that you have an Instagram profile, inform everybody to increase the number of followers. Use your other social profiles such as Facebook and Twitter to inform your customers about your Instagram profile. If you maintain a mailing list, you can send emails. Add a social button for Instagram in your website. The main purpose of Instagram is to share photos and that is what you must do. Try to avoid posting images that are pure advertisements. Even commercial type of photos should be avoided. The photos should express a particular emotion, preferably one that signifies your brand best. If your company is meant for the youth, post images that exude energy. Use the filters to your advantage. Make the best use of the time limits imposed on Instagram videos. Instagram makes the most use of the hashtag feature. People use hashtags in Instagram to search for interesting content. Adding hashtags can significantly improve the number of followers and reach. Ensure that the hashtag is appropriate for the image you are posting. Instagram is a social network. With a few tips, you can use the network to create marketing opportunities.